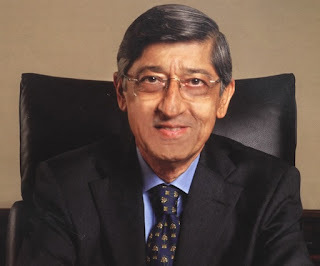 Ashok M Advani, Chairman, Blue Star Ltd.
Blue Star Ltd (BSE: 500067, NSE: BLUESTARCO) counter in BSE on Friday witnessed a major accumulation of 25 lakh shares by SAIF Partners, a leading Asian private equity player. The deal was disclosed at Bombay Stock Exchange after trading hours on Friday. SAIF India IV FII Holdings Ltd bought a 2.78% stake in Blue Star at Rs. 190 a share, in a deal worth Rs. 47.50 crore. It is an accumulation for this SAIF Partners’ fund, as it had a 1.39% stake as of Q1 end, in this leading central air-conditioning company of India. Using Friday’s buy, this India & China focused PE fund has tripled its stake to have a total of 4.17% in Blue Star. Despite the massive size of the buy, much of the sheen is not there, as there was an even larger institutional sell on Friday, when HDFC Standard Life Insurance Company offloaded 28.62 lakh shares at Rs. 190 a share. Two HDFC Group companies - HDFC MF and HDFC Standard Life - together constituted the largest non-promoter shareholder group in Blue Star with a combined stake of 8.77% as seen in Q1 Share Holding Pattern (SHP). For HDFC Standard Life Insurance, Friday’s sell appears to be a total exit strategy, as it has sold off 3.18% of the 3.33% stake it held in this Indian air-conditioning projects company with significant Asian operations. Post Friday’s buy, SAIF India has become the second largest non-promoter shareholder in Blue Star, behind HDFC MF’s Capital Builder Fund, and ahead of other institutional investors in the counter like SBI Mutual Fund, Equinox Partners LP, ICICI Prudential, and Oriental Insurance Company. When SAIF India identifiably bought into Blue Star stock for the first time in mid June, at Rs. 174.93 a share, the seller was Equinox Partners. But Equinox retains a significant 2.82% stake as on Q1 end. Massive sellers of Blue Star like HDFC Standard Life and Equinox are obviously disillusioned with the way the once high-flying mid-cap performer has lost value in the year-to-date. Blue Star stock had fallen from a 52-Week High of Rs. 315 during late August to a 52-Week Low of Rs. 150.55 by December end, and had rebounded only marginally, and was trading in a range bound manner until now. The fundamental performance was the culprit, as both the standalone and consolidated Blue Star struggled to contain operating expenses as well as interest costs. In FY’12, its bottomline had also slipped into deep red, both on standalone and consolidated basis. However, in Q4, its standalone topline has seen a major up-tick, and if this sustains, it can be the beginning of a much awaited turnaround in performance. The bad bottomline performance in FY’12 is also attributed to one-off losses in some key contracts. It is interesting that the major institutional churn in this air-conditioning company’s stock has occurred prior to Q1 results which is usually good for such companies due to high demand during India’s hot summer months. Apparently, different institutional investors are taking contrasting calls on this short-term prospect of Blue Star too. But whether Q1 results will be up to the expectations or not, SAIF seems to have taken a long-term call on Blue Star, especially on its demonstrated ability to generate a Return on Equity (RoE) of 31% as seen in FY’11. The bet is obviously that Blue Star may gradually return to that kind of performance in FY’13 or FY’14. Blue Star undertakes projects in central air-conditioning, building electrification, plumbing / fire fighting systems, cold chain etc, and has its own manufacturing division. SAIF Partners’ major investments in India include Havells India, IL&FS InvestSmart, Taj Hotels, JustDial, MakeMyTrip, NSE, Network18, Pennar, PropTiger, Thermax, and Speciality Restaurants. On Friday, Blue Star rallied and closed trade in BSE at Rs. 191.15, up by 4.08%, in a general market that closed marginally down.